So not much happened in the sixth week of the 2014 college football season. Only five of the top eight in the AP rankings lost, the first time that has ever happened, and eleven ranked teams lost. 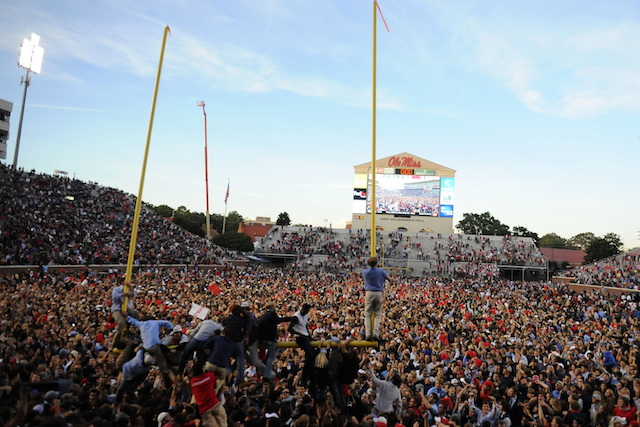 We saw crowds storm the field, fans tearing down the goalposts, and an epic Hail Mary. Other than that, nothing major. What does all of this week's shenanigans mean for the state of college football right now? Here's what I'm thinking. If there was any doubt that the SEC West is the best and deepest division in football (and with how mediocre the SEC East is, you could call the West the best conference in football), that went out the window Saturday in the Magnolia State with Ole Miss stunning Alabama and Mississippi State smashing Texas A&M. Both teams had impressive showings yesterday and showed they were for real but as both will be in the top ten in the polls at the same time for the first time ever, their schedules do not get any tougher. They will each get Auburn, who looked awesome in blowing out LSU at home, at home, while Ole Miss will have to go to LSU in a few weeks and Mississippi State will go to Tuscaloosa next month. But now the Egg Bowl will have significant implications not just in the division but also in the College Football Playoff, and that has never happened before. Speaking of the Playoff, while it is about impossible to predict what the selection committee will do in selecting the four teams in the Playoff given this is in its first year, but there were plenty of results yesterday that will help shape what the teams will look like. And I think that more that teams lose and get their first loss, that helps the SEC's chances in getting a second team into the field. I am of the mindset that the committee will view a one-loss SEC team, like Alabama, in higher regard than say a one-loss Oklahoma or Oregon. Regarding Oregon and the Pac-12, the conference has proven itself to be the second-best conference in the country at the moment as it continues to cannabalize itself. With Oregon falling at home to Arizona, UCLA falling at home to Utah and USC falling at home to Arizona State, the middle-tier of the conference has shown that it is getting closer to the top-tier but these are the kind of losses that may just result in the conference being shut out of the Playoff. Stanford was not in conference play but they also lost as they were on the road at Notre Dame. The Fighting Irish may just be poised to repeat their 2012 when they were able to slide into the National Championship Game. They have some sneaky contests but they also have some opportunities to get more big wins to strengthen their Playoff resume, most notably when they visit Tallahassee in two weeks. Florida State now will be the clear number one in the rankings and given how subpar the ACC looks, they have got a clear path to the Playoff should they defeat Notre Dame on October 18th. That said, they don't looked as impressive as they did a season ago and they could very well lay an egg somewhere in conference play. But now as they seem to be surrounded to be pandemonium, they're looking relatively safe for now. Of course, there is still a whole lot of time left in the college football season and as we saw yesterday, EVERYTHING can change on a dime.